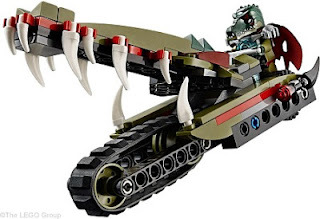 It appears in Olive Green within Cragger's reptile raider (see pic) which is part of the mammoth 70010 The Lion CHI Temple - a set I'm really looking forward to for many reasons. I had the honour of speaking to LEGO Senior Product Designer Mark Stafford about it recently on the LEGO® Inside Tour. Several designers worked on the set, the final one being Mark. He said he took the best ideas from each of the designers' builds then brought it all together with some classic 375 Castle! But I digress. Back to the bows. Whilst on the topic of The Lion CHI Temple, here's another great inclusion. 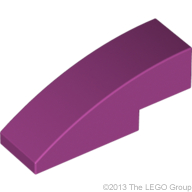 This pair of large angled bows is a favourite amongst spaceship builders, including Mr. Mark Stafford. So they will appreciate having these now available in Dark Brown and no doubt there will be Star Wars sets using these elements soon. Dark Brown is a fledgling new colour that isn't getting much attention in the arena of basic bricks and plates. Instead you see it used more for detailing, especially as contrast to Reddish Brown. Hopefully a building - perhaps a Modular - will come out in this colour and provide that all-important array of basic pieces. I tend to avoid buying 'full' bows like this aircraft fuselage as they are less useful than half-bows. But in its favour: this new one is just two studs wide - usually they are six - so will be of greater use, it's bley, and as I mentioned at the start inverted bows are rare in LEGO. Beggars can't be choosers. 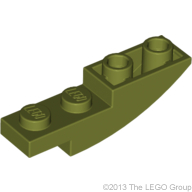 It's already available, in 60022 Cargo Terminal where you'll also find these matching two-wide upper halves. And finally, let's make some brand new Friends. All the rest of this post's elements will be found in just one set for the time being, 41013 Emma s Sports Car . At first glance I assumed these two were Medium Lavender (see the darker example at bottom of pic), which is a recent but now common colour in Friends; but in fact they are simply Lavender - a colour previously only used in recent Duplo and in 8805 Series 5 Collectible Minifigures Fitness Instructor, for that cute little ghetto blaster she holds. This year it has begun to appear in Friends figures and accessories, and will be used for the two Umbaran soldiers' heads in 75013 Umbaran MHC" (Mobile Heavy Cannon) . Yup, Lavender comes to Star Wars. Who says LEGO don't reflect diversity? But Emma's Sports Car marks the first time that useful System pieces have appeared in Lavender. So it looks like the Friends range will continue to expand the LEGO colour palette - I'll be blogging about more 'new' Friends colours - which is great news. Although expanding the subtleties of the purple spectrum might not have been my number one choice! 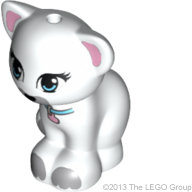 This rich colour has popping up since 2000 in various girls' themes, Duplo and Disney/Pixar themes. I wouldn't say I use it often! But it is one of my preferred purples thanks to its boldness. 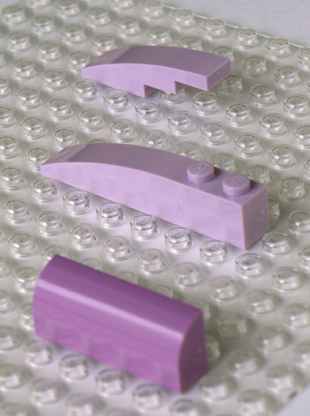 There is a good range of bricks, slopes, tiles and plates available, but only some are found in recent Friends sets like 3315 Olivia s House , 3932 Andrea’s Stage and 41004 Rehearsal Stage - to get the others you'll need to spend some time and money on parts resale sites like BrickLink or Brick Owl. Ah, now this must be a less contentious colour with the general populace. 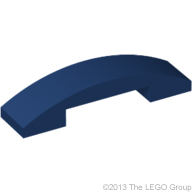 It has a great inventory of parts and now comes in this beautiful piece I call the 'telephone' bow. And whilst discussing these colours, note that Emma's Sports Car also comes with some new plates too. The first ever Lavender plate is a 2X6, the Magenta [BL] / Bright Reddish Violet [TLG] 1X4 Plate is introduced along with the Lamp Holder (aka. clip light) and in Dark Blue [BL] / Earth Blue [TLG] we get the 4X6. Just to be completist about it (plus I heard cats are quite popular on the internet), there's one more brand new part solely available in Emma's Sports Car. Awwww. Kitty! OK, kitty is not a bow but you can put a bow on her head. So that makes 15% of the pieces in this set new and exclusive elements - that's a damned good proportion for any set, and it's just US$14.99! 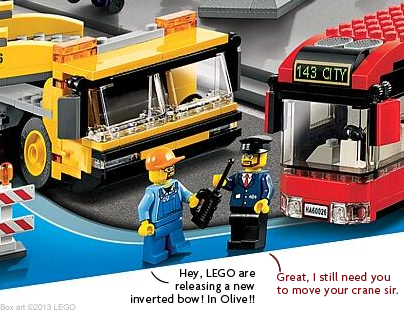 Of course, you can buy it from The Official LEGO Shop and the usual stockists; and by choosing the affiliate links below to purchase you help support the New Elementary. 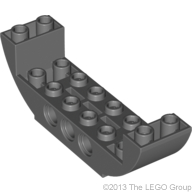 All new sets mentioned in this blog can be quickly located on this Brickset BrickList. Not related to bows, but Emma's car set seems to also include 2 (i.e. 3) green 1x1 round plates, which are bothersomely rare considering how normal both the part and the colour are. You'd think that element would have been easily in a few dozen sets since the late 80s - early 90s. And you'd be very wrong. Hopefully we will see more of it in the future. Good point. So strange, especially given their usefulness in landscaping and plant-making. Let's hope the part price comes down as a result. I'm desperate for the Gothic arches too! Unfortunately I only have two so far but will definitely be posting when I have more. Thanks for commenting! Ah - thank you so much for bringing that to my attention Jonathan, I'm going to fix this post. And buy that set!!! This is a classic example of how tricky research is and how I will need to depend on my readers to help, just as you have. That black element is not listed in LEGO's online inventory for that set (this is quite common but I have no idea why it happens) plus Bricklink's inventory came out just after I had done my research for this post. Completely agree re Black being more useful than Olive! But as you'll read soon, I've had some fun with the Olive ones. You should write something for the "Plate W. Bow 1X1X2/3". It's like my favorite new piece (Maybe favorite piece altogether). You can find it in the Star wars "Corporate Alliance Tank Droid" and a few other sets. It's a really nice piece. Let me know what you think and please post links to stuff you create using it! This isn't related to bows, but who else thinks that reptile raider is the coolest Chima vehicle yet?! I all ways love the treaded vehicles. Good job with all of this! It's certainly on the wish list. FYI the element IDs I know of are 6138663 (Aqua) and 6142402 (Bright Red), hope that helps.